Some of you dear readers might be in the process of moving summer wear to the far reaches of your closet to make room for transitional or even fall garments. But I want you to caution against being too hasty. What I am saying is: It. Is. Still. Summer. If you live in California, Milan, or even Seattle, you will definitely be more comfortable this weekend in shorts or a short skirt rather than midi skirts or turtlenecks currently being shown everywhere as transitional clothing. I have decided to feature a brief retrospective of my favorite casual, yet fun summer wear I spotted in Milan, New York, and San Francisco – this very season! – to spark ideas as to what to wear to that outdoor movie, beach bonfire, picnic or barbecue. Many looks are made up of clothing not too unlike, I suspect, what we already have in the closet. It’s just a matter of coordinating/mixing it all up. Although I previously featured a couple muses pictured above in posts about crop tops and dresses with sneakers, I could not leave them out of this collection of favorite summer looks – which include an excellent example of wearing booties in summer. The muse to their right demonstrates creative flair in a mini-skirt and tank top combined with tall boots. Yes, she wears tall boots in summer! Hey, why not? It’s like the reverse strategy of what I do in cool weather: covering up with sweater/coat on my top half to afford myself an evening in heels. The statement necklace is also a surprise, since I generally consider something like that to be too heavy for summer, but it works, don’t you think? Thinking the outfit is too “young” for you? If you are beyond her years but of a figure to wear shorts, it can totally work if the mini is slightly longer and the top has a higher neckline and/or short sleeves, perhaps like the ones on the muse pictured below at center. I love the way her handbag, sandals, and denim skirt are understated enough to avoid competing with the eye-catching (summery!) top. Notice also how stylishly the muses on either side of her coordinate with basics – surely you have some of these. Special touches I especially like: cat-eye sunglasses, rope-belt tied in a bow, bracelet to match brightly-colored shorts, and the lovely, sophisticated tote to add polish to a simple black and white ensemble. A couple of New Yorkers pictured below present a slightly edgier vibe than the muses above. One thing which stands out about them is that they give careful consideration to shoes, and sometimes, a handbag. a denim shorts outfit (here, an adorable onesie) made more elegant with a LV handbag and matching tan platform sandals – great example of combining shorts and heels tastefully! 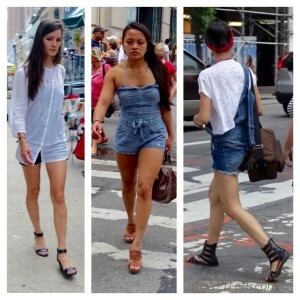 overall shorts over a plain white tee and spiced up with black gladiator sandals and retro red headband. In the San Francisco Bay Area, people seem more interested in expressing their style through the car they drive than via handbag or shoes, but our two muses from that area in no way lack style. We have here another muse donning tall boots (Tory Burch) in summer. Combined with a neat white button-down blouse and scallop-hem shorts, they give the look an unexpected boost of style. To the right, we see how black can be successfully employed as a neutral, but give the look an edgier, urban vibe than would a more traditional pairing: skirt with ivory or blue top. Hope these looks have inspired you as they have me this summer and most of all, give you some ideas for boosting your style through the end of summer and if you are lucky, into an Indian summer! Favorites are the girl carrying the LV purse and the other girl wearing a black gladiator shoes.